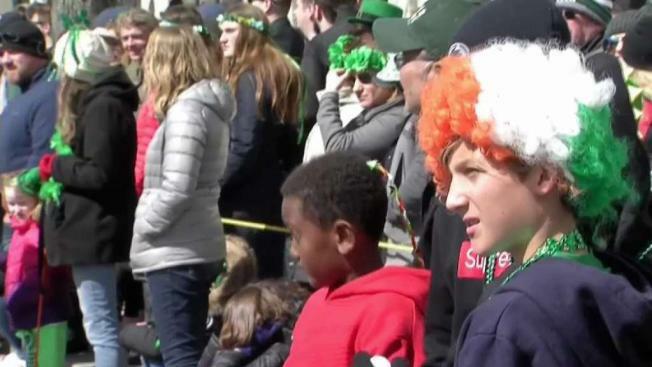 Thousands of people turned out in Southie to watch the annual Saint Patrick's Day parade. They got the chance to see marching bands, bagpipe players, and Irish UFC Champion Conor McGregor, who ended up being a big hit with the crowd. Boston police say they ended up arrested several people Sunday. More than 150 people were busted for public drinking and nine others were arrested during Sunday's St. Patrick's Day Parade. Boston Police said they issued 128 citations for public drinking, two for marijuana and issued three license premise violations. They made three arrests -- a 17-year-old male from Easton for being a minor in possession of alcohol, a 20-year-old from Taunton for assault and battery and a 22-year-old male from Green Harbor for disorderly conduct. All three men were arraigned in South Boston District Court. No bail information was available. MBTA Transit Police also reported that they intercepted dozens of parade goers who were drinking on the T and made six arrests, three of which involved violent confrontations. Around 11 a.m., transit police officers riding on a Forge Park train to monitor the large crowd heading to the parade observed two people intentionally punching out overhead lights on board, causing over $7,000 in damage. A 17-year-old female juvenile from North Attleboro and 18-year-old Brendan McHugh of Attleboro Falls were taken into custody for malicious destruction of property. Around 3:30 p.m., while transit police were speaking with an intoxicated male at Broadway Station, a 23-year-old male climbed over a barricade, struck the other male in the face with a closed fist and then fled. Transit police chased the suspect and were able to apprehend him. The suspect, identified as George Sawchuck of Cumberland Center, Maine, was taken into custody. At 4:15 p.m., as parade goers were boarding a Providence train at South Station, officers observed two men violently pushing through the crowd so they could cut the line and enter the train. Officers intercepted them, and one of them pushed an officer. The suspects, identified as Othane Chabane, 20, of Bristol, Rhode Island, and Evan Thornton, 20, of Swansea, were placed into custody. Around 5 p.m., transit police at North Station saw a man on top of a 19-year-old male, forcefully shaking the victim's body and causing his head to hit the ground repeatedly. The suspect, Keenean Parlin, 21, of Billerica, was charged with assault and battery with a dangerous weapon.